The Congress on Monday slammed Prime Minister Narendra Modi-led Government for allegedly starting ‘crony capitalism’ in the country by giving offset contract to Reliance Defence and Engineering Limited instead of Hindustan Aeronautics Limited. 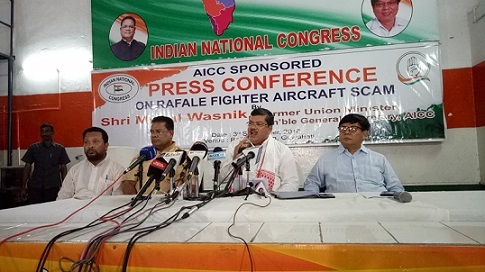 Former Union Minister and All India Congress Committee (AICC) general secretary Mukul Wasnik during a press conference here alleged that the BJP-led Central Government has ‘disobeyed’ all the rules and regulations of defence procurement procedure in purchasing Rafale fighter aircraft. “Does Modi know better than the IAF authorities? How can a person (Modi) with zero experienc can fix purchasing of 36 fighter aircraft instead of 126?” Wasnik questioned. Wasnik claimed that the United People’s Alliance (UPA) Government had decided to purchase 126 Rafale aircraft after a high level discussion with the IAF authority. “It was the Congress Government which decided to purchase aircraft at a cost of Rs 526.1 crore per aircraft. But the BJP Government negotiated to purchase at a cost of Rs 1670.7 crore per aircraft. We demand the BJP Government to come clear with fact sheet about the Rafale deal,” Wasnik said. The Congress leader further alleged the Modi-led Government did not take any permission from the Cabinet Committee on Security in the Rafale aircraft issue. Wasnik also slammed the BJP-led Government for giving offset contract of Rs 30,000 crore to Reliance Defence and Engineering Limited to construct fighter planes. “Why didn’t the Hindustan Aeronautics Limited, which is most experienced and old company in such matters, get the offset contract for construction of Rafale fighter aircraft? Will Narendra Modi tell the people of India about the reason?” Wasnik questioned. Besides, Wasnik said that the BJP-led Government did not even invite tender for construction of fighter aircraft. Stating that the first Rafale aircraft would land in the country in September next year, Wasnik questioned whether that was PM Modi’s emergency purchase. “Modiji gave a statement in September, 2015 and not a single aircraft has landed till September, 2018,” Wasnik said. The Congress demanded that a joint parliamentary committee be constituted to conduct hearing in this matter.